Amazon Alexa is billed as a voice-activated personal assistant, but that “voice-activated” part is problematic if you can’t speak at all or have speech challenges. To fix that, you can take advantage of the many features offered by Alexa and the Alexa app to make Alexa devices accessible to those with speech problems. You can use the Alexa app to perform many Alexa tasks by tapping instead of speaking, including creating lists and adding items to lists, setting reminders, viewing contacts, creating smart-home routines, and adding skills. If you have trouble saying “Alexa,” you can try a different wake word. If you have an Alexa device with a screen, you can use the Tap to Alexa feature to issue Alexa commands by tapping instead of speaking. If you have an Alexa device with a screen, you can swipe down from the top of the screen and use the status bar to set alarms, create smart-home routines, and control smart-home devices. If you have an Alexa device with a screen, you can send text messages by tapping instead of speaking. When you enable Tap to Alexa, you can tap the Echo Show Home screen to display a grid of icons — Amazon calls them tiles — that represent common Alexa tasks: getting the weather or news, setting a timer or alarm, playing music, or adding an item to your Shopping or To-Do list. Tap the Tap to Alexa switch to On. With Tap to Alexa enabled, your Echo Show’s Home screen now includes an icon of a pointing finger “tapping” the screen. Tap that icon and you see the Tap to Alexa screen, shown here. Note that you can swipe left to see a second page of tiles. The default first page of the Tap to Alexa screen. What happens when you select a tile depends on the underlying task. Tapping the Weather tile is the same as saying, “Alexa, tell me the weather,” so you immediately hear Alexa giving you the current weather conditions and forecast. Similarly, tapping the Music tile is the same as saying, “Alexa, play some music,” so you hear a random playlist. 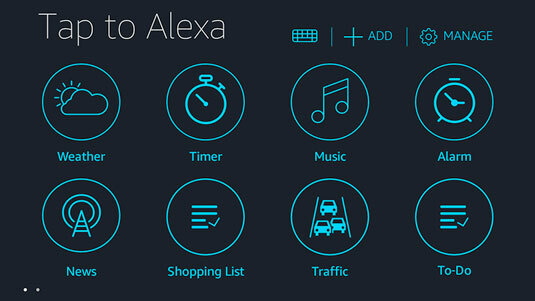 Other tiles such as Traffic, News, and Joke also invoke Alexa immediately. Some tiles represent tasks where Alexa requires more information from you. For example, tapping the Timer tile displays a screen that presents you with several options for the length of the timer. Similarly, tapping the Shopping List tile displays a screen that enables you to enter the item you want Alexa to add to the list. Keyboard: Displays an onscreen keyboard, which you can use to send any command you like to Alexa without having to use your voice. Add: Enables you to create your own Tap to Alexa tiles. When you tap Add, the onscreen keyboard appears, which you use to enter the command you want Alexa to carry out. You’re then prompted to select an icon and enter a label for the tile. When you’re done, your new tile appears in the Tap to Alexa screen (starting on the second page) using the icon and label you specified. Manage: Enables you to rearrange the Tap to Alexa tiles by dragging and dropping them. You can also delete a tile you don’t use by tapping the X that appears with the tile. Alexa’s feature that enables you to speak a text message and have it sent to someone in your Contacts list is convenient and easy. Well, it’s convenient and easy if you can say the “Alexa, send a text” command and speak your message. If you can’t, are you out of luck? Nope, not if you have an Alexa device with a screen. The Echo Show and Echo Spot both support a feature that enables you to send texts (as well as place phone calls) by tapping the screen. Tap the Calling & Messaging Without Speech switch to On. With the Calling & Messaging Without Speech switch enabled, when you swipe down from the top of the screen you see a new Conversation icon — a speech bubble — which represents the Calling & Message feature. Tap the Communication icon (the speech bubble). The Calling & Messaging screen appears. Alexa displays a list of the contacts that are eligible for messaging. Tap the person to whom you want to send your message. Alexa displays an onscreen keyboard.